MASSIVE 148 page issue #76 of FIREWORKS out now! Fireworks Magazine just got crazy BIG and crazy BETTER! This new issue is a MASSIVE 148 pages (that's 16 pages more than the late lamented Classic Rock: AOR – and £2 cheaper!!). And not only do you get 148 print pages but there is also a 38 page PDF on our free CD along with 74 (Seventy-Four!) mp3 songs. All for £5.99. Are we crazy? Yes, we are, but we're crazy fans of Melodic Hard Rock & Metal and want to share all this goodness with you, the fans. There is something for everybody here. For fans of classic American Hard Rock we have Dave Reynolds doing updated interviews with Angel, Starz and Legs Diamond. NOT to be missed! Elsewhere we talk in-depth to Aerosmith's Brad Whitford about his long awaiting second album with Derek St Holmes, as well as Bun E. Carlos on his time with Cheap Trick and debut solo CD. We also have Johnny and Donnie Van Zant bringing us up to date on their new live album, and speaking of Southern Rock, Blackberry Smoke are here to discuss their latest release with us. For 80s/90s US Melodic Hard Rock we catch up with Tyketto, Hardline and Mitch Malloy to discuss their great new albums. 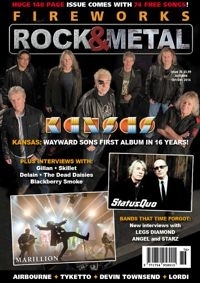 For Prog fans we have great interviews with Kansas, Marillion, Evergrey and DGM. You want AOR? You've got it! Change of Heart, Dante Fox, Angels Or Kings and Miss Behaviour. Classic UK Rock? We talk to Ian Gillan, Status Quo and the Tygers of Pan Tang. Symphonic Rock? We have a dose of Epica, Twilight Force, Delain and Sonata Arctica. Plus even more interviews with Lordi, The Dead Daisies, Skillet, Beth Hart, Ray Wilson, Sabaton, Rox, Pain, Devin Townsend ... and so many MORE! Alongside this issue's Take 5, Unsung Heroes (a 4 page look at the career of bassist Chuck Wright), Expert's Guide (FM) and Breaking Bands we have two new features starting this issue from Rob Evans: the first is called 'Sisters In Rock' and looks at the ladies who have brought some great music to us over the years; some well-known, others a little more underground. This first column features Darby Mills, Robin Beck, Toronto's Holly Woods and Storm's Jeanette Chase. Rob also takes a dip into the world of hard to find AOR vinyl in 'The Vinyl Countdown'. Plus a competition run in conjunction with The Room – be a video interviewer at their Oct 23rd gig, to go on the live DVD as an extra. Hotel room and tickets covered too. Awesome stuff! Add to this 40 PAGES of the most in-depth album reviews out there, then you can see we have totally gone to town on this issue. Interviews, reviews and 74 FREE songs: LET'S ROCK!